The Augustinian Recollect Nuns constitute the feminine branch or Second Order of the Recollection. Monasteries of these nuns are found in Spain, in Mexico, in the United States, in Africa, and in the Philippines. They are established in two federations, one based in Spain and the other in Mexico. Though members of a federation, each monastery of nuns is autonomous, having a prioress at the head of each community. 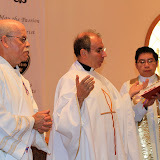 The religious featured here are members of the monastery of the Immaculate Conception located in Irvington, New Jersey, USA, and form part of the Mexican Federation. The nuns maintain their contemplative way of life though the making of liturgical vestments (some chasubles are hand painted) and linens, baking, catering, and repair of religious statuary. The life of an Augustinian Recollect Nun is one of prayer, sacrifice, adoration, study, and manual labor, all seasoned with inexpressible joy at being a bride of Christ.